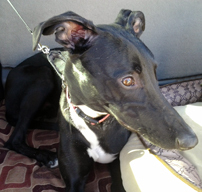 Bailey is our new little greyhound puppy! She was rescued from a "Field Trial" in Ohio and brought to Arizona. Her rescuer was unable to keep her so AGR has welcomed her into our family. Bailey has a ton of puppy energy. She is a bundle of fun and walks great on a leash. If you are an experienced foster, she would benefit from and appreciate you! Or perhaps you would like to add some puppy love to your home and family! UPDATE: Bailey has a forever home! Best of luck to Bailey and her new family!